At the widest point shown in the picture, this sidewalk is three feet wide; it tapers down to nothing. It is difficult to use, even by able-bodied pedestrians. 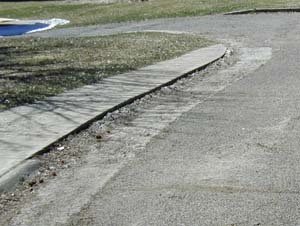 Residential sidewalks are often four feet wide, but that should be considered an absolute minimum. Six feet is better, because it allows people travelling in opposite directions to pass comfortably, and allows two people to walk abreast. Eight feet is preferable if the sidewalk is shared by pedestrians and bicyclists. Sidewalks that are too narrow encourage people to walk in the street, which is dangerous. Keep in mind that sidewalks need to accomodate people in wheelchairs, blind people with canes or guide dogs, parents with toddlers or pushing baby strollers, and a variety of others. A sidewalk that is comfortable only for a solitary walker is inadequate.